Making your family Easter more meaningful can sometimes feel like a stretch, at least it’s felt that way to me. As a Pastor’s Wife and Children’s Ministry Director, my Easter focus is usually centered on planning events for the church and the community, without much additional attention to what we do at home. This year I wanted to make our family time at home more meaningful. In searching for “more meaningful Easter” I was hard pressed to find any ideas beyond how to make eggs and bunnies more relevant to the holiday. 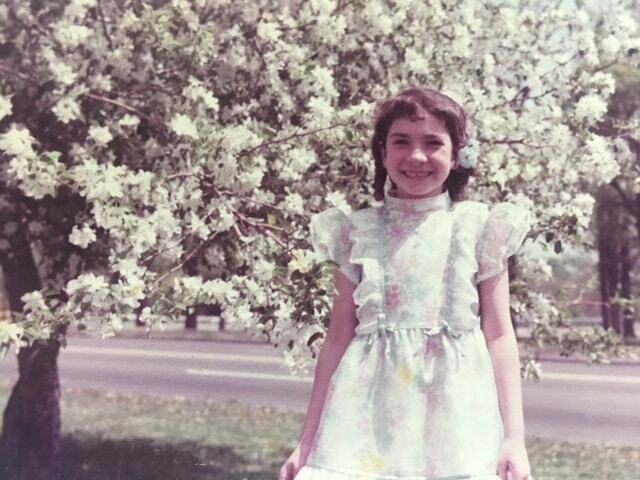 I was wanting to go deeper into incorporating the Resurrection of Jesus into our Easter celebration at home. More specifically I wanted our celebration at home to better highlight the implications that the Resurrection has for our lives today. Here’s my family plan this year for a more meaningful Easter at home. In case you’re wondering what the whole egg thing has to do with Easter, the roots trace back to Medieval Europe where chicken was a popular source of protein for peasants and serfs. During the 40 days before Easter, known in Catholicism as Lent, people refrained from eating meat or dairy products and this included eggs. Towards the end of Lent, eggs were boiled to preserve them long enough to keep until Easter. The most common treat to break the fast was usually an egg. Today, the eggs have come to represent new life. The bodily resurrection of Jesus represents a brand new life for all who believe in Him. Easter baskets have been a source of joy for Jeff and I since we were kids, so we have continued this tradition for Luke. Typically he opens his basket on Easter morning upon waking, but usually we are in such a rush to leave for church that we are not very intentional with making the Easter basket time very meaningful. When I was little, my Mom would always hide our Easter baskets and my brother and sister and I would run around the house trying to find the basket of treats. This year, Jeff and I will hide Luke’s basket to enhance the joy of the celebration. Upon waking, we will read the Easter story together and share our thoughts on the significance of the Resurrection. Then we will turn Luke loose to rummage through the house. I have been known to pick up a pre-made Easter basket from the grocery store for Luke the day before Easter. This year, to make the actual basket more meaningful, I am going the home-made route. I am planning to put an Easter book in his basket and read it with him before church. I went to the library this week to try to research some meaningful Easter books and found a really good one called Easter by Gail Gibbons. Another is The Easter Story by Brian Wildsmith. This list of good and not so good Easter books for kids is also a valuable resource. I’m vacillating between reading the Three Trees with Luke on Easter morning (which always makes me cry) or finding a new favorite. In addition to an Easter book and quality time reading together, the basket will be overflowing with candy like a giant blow pop, pop rocks, big league chew, gummy bears and dark chocolate. In terms of snacks I will include Sriracha peanuts and Hit cookies. One of the most meaningful things to do in life is to share a special meal with loved ones. We always do so for Christmas and Thanksgiving but we have never had any type of formal planned meal for Easter. This year I decided on brunch, even though we likely will not be eating until 1pm after the festivities at church, but pancakes for lunch never hurt anybody. Here’s how I’m planning to make it special. 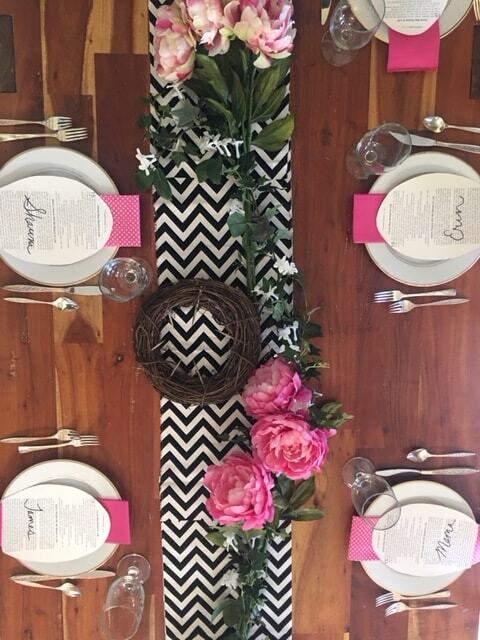 A few years ago I read an article in Life Beautiful Magazine that talked about using black and white table decorations for Easter to represent the dark sin of our lives that is erased and made white as snow by the sacrifice of Jesus. I loved this way of looking at the meaning behind your Easter table decor and as I thought about how to make our Easter meaningful, I wanted to incorporate these colors into the table scape. In order to incorporate something more significant than bunnies to the table, I created a crown of thorns to represent the death of Jesus and surrounded it with a garland of Spring flowers to represent His Resurrection. Finding table runners and napkins proved difficult because I couldn’t quite find anything that fit my vision so I settled on a very lazy DIY solution for both. I bought the raw fabrics for each in patterns and colors I liked and literally just laid them out on the table. In order to span the length of the table, I had to cut the 1 yard canvas in two in for the runner but that was it. I used Crafty Cuts Canvas Cloth in Chevron and 18×21″ pink cotton fabric by Loops & Threads. To make the garland of flowers, I used this faux floral garland from Michaels and their Spring decorative flowers are 50% off right now so I bought nine pink and white peonies and clustered them along the garland in groups of three. I secured the garland to the flowers with wire. Making the crown of thorns was super easy. 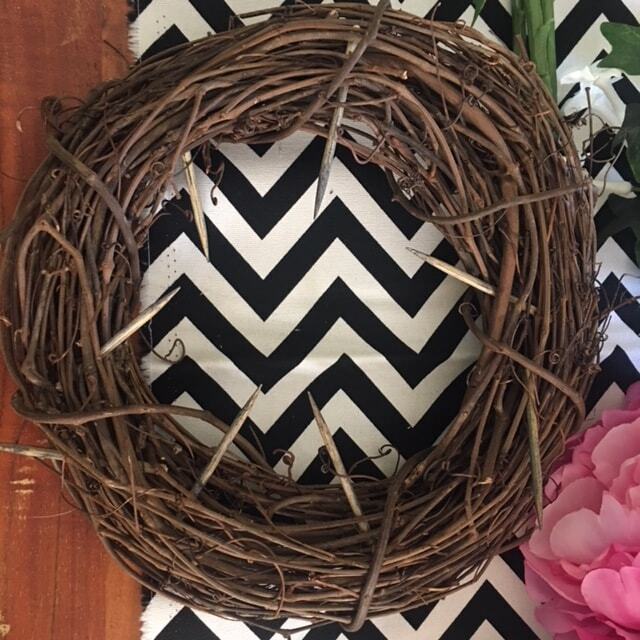 I took a grapevine wreath and wiped the tips of seven bamboo skewers with a black shoe polish sponge. Then I cut the tips off and stuck them into the wreath. 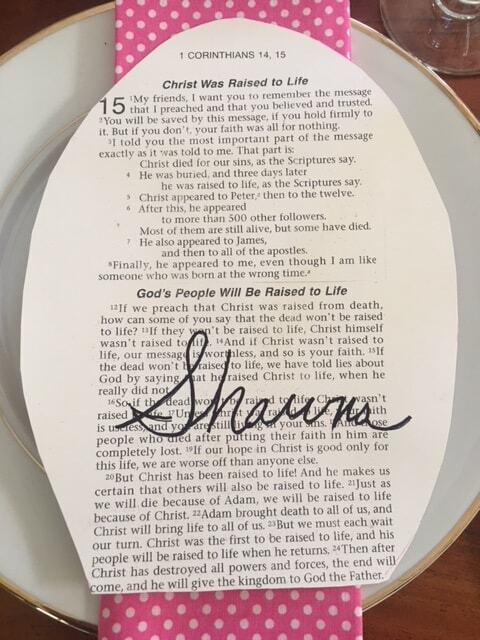 For meaningful place cards, I chose the section of scripture that explains how we too will be raised to life as Jesus was (1 Corinthians 15). 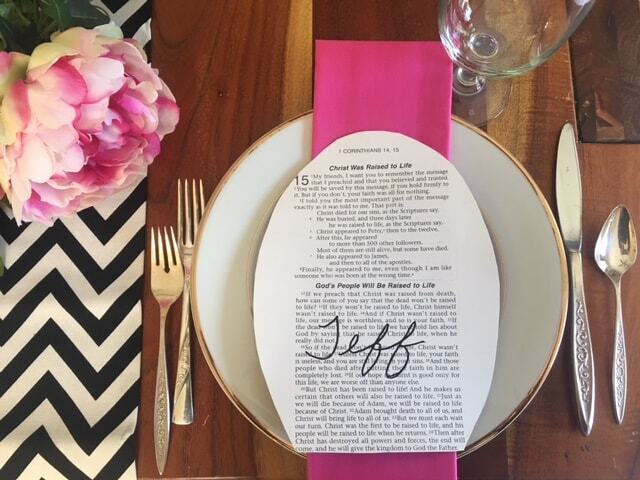 As a way to personalize the passage for each guest, I hand wrote each person’s name directly over the scripture. To make the scripture place cards, I photocopied the passage from the Surfer’s Bible at a 115% enlarged view onto white poster board (which I cut into 8 1/2 by 11 pieces to fit the copier). Then I cut out an egg shape from the copy and wrote the name of each person in pen, then traced it with a black Sharpie. So often we eat with our close family and friends and don’t really get to know anything deeper about one another. When I worked in sales, it was my part of my job to establish relationships with people. I learned early on that the simplest way to build relationship is to ask people questions about themselves. Turning this skill on your family can result in deeper more meaningful relationships that draw you closer and help you discover new things about each other. 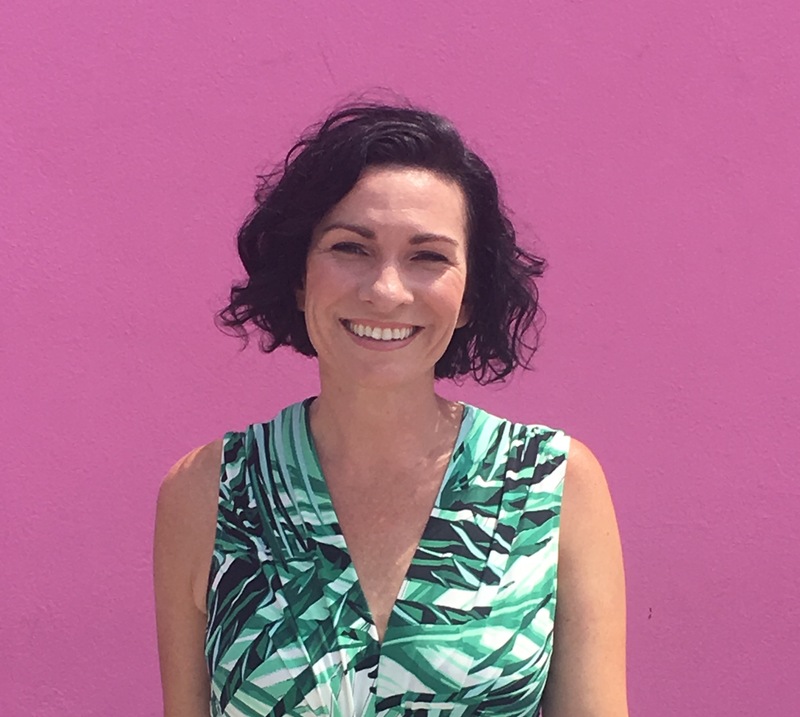 Here are a few conversation starters for Easter brunch along with my personal answers so you can get to know a little bit more about me. It’s a shame we don’t spend more of our lives outdoors, especially here in Southern California where the weather’s so great most of the time. Spending time in nature with loved ones is an ideal way to make your Easter more meaningful. Taking in the fresh smells of Spring together and leisurely enjoying the outdoors is a great way to build memories because studies show that memory is enhanced with smell. We have never done an outdoor activity with our extended family before, but this year I am going to propose we go for a family hike or walk around the block after brunch. To summarize, if Jesus didn’t rise from the dead, my faith is completely in vain. Therefore I wanted to find a way to celebrate this event at home with my family in addition to our church celebration with the community in order to make a more meaningful Easter. I hope these ideas inspire you to have a more meaningful holiday too. This post was shared on Salt and Light Linkup where you can find more inspirational posts for your day. I love how thoughtful you are with all these elements for a memorable Easter celebration. You’ve give some very doable ideas to help even the not-so-crafty person make special items for Easter. Thanks a bunch! I’m so glad. 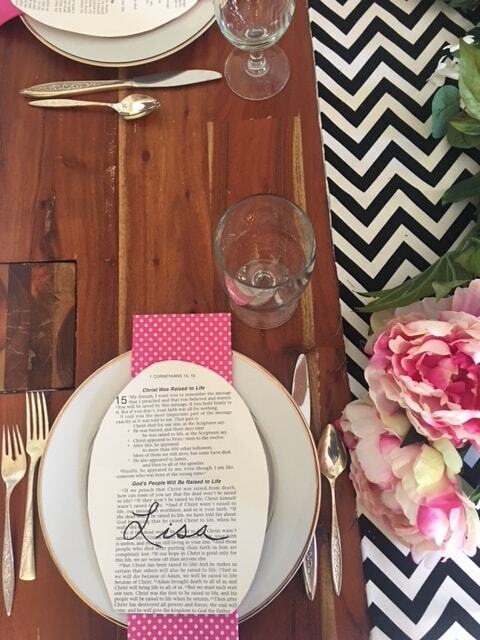 Crafting can be so intimidating sometimes but truly anyone can pull off this tablescape! Yes, I find that remembering Christ even in small ways for non-gatherings can uplift my soul too! This is great! We just wrote about the ways we are making sure there is meaning in our Easter too. Thanks for sharing! I just took a look at your posts, Michelle. So glad to find a kindred spirit looking for making Easter more meaningful. Thanks!